Eurocamp recently sent my family and I to review La Pointe St Gilles Campsite in the beautiful beach resort of Benodet. Whilst I was there I wanted to find out how the environment is taken into consideration on site, so I asked a lot of questions! 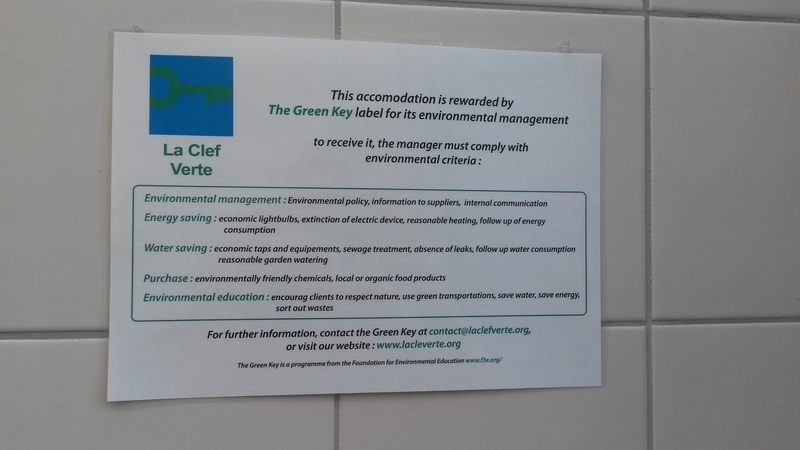 The resort has been awarded a green key label as pictured above. They generate some of their own electricity via onsite solar panels. They save energy and water with motion sensitive lights and taps in the main toilet block at night. The toilet in our mobile home had a dual flush option so you could choose to half flush. 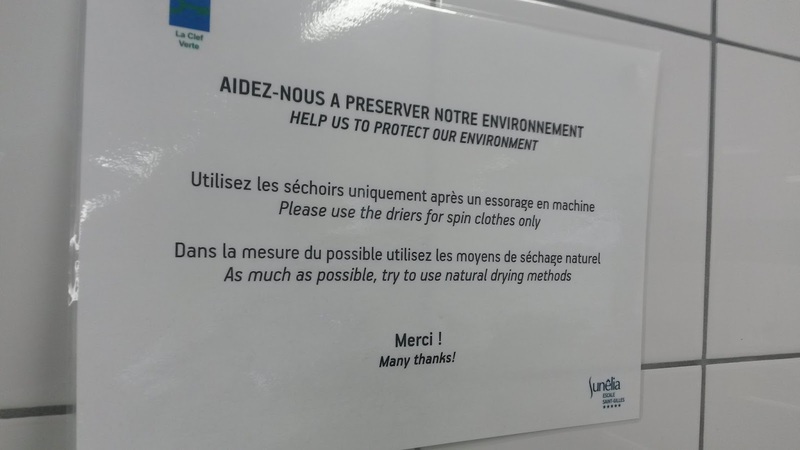 There is a sign in the laundry room encouraging people to save energy and hang out their washing instead of using the tumble dryers and clothes airers were provided to each mobile home. Some of the Eurocamp cleaning products that they use are fully biodegradable and the site management clean out their own mobile homes with bicarbonate of soda, vinegar and lemon juice (but they don’t clean out the Eurocamp ones). Any cleaning products left behind by guests are made use of by the Eurocamp couriers and they also keep any food that is unopened/ in good condition. Lost property is kept for 3 months in case it is claimed and if not claimed it is kept by the Eurocamp couriers if they can make use of it. At the Eurocamp reception they have a book swap area, which was great as my husband and I found and swapped a few books we liked there. They also had some sports and games equipment some of which had been left behind by other guests and they were very happy for us to swap/ borrow /keep. Top tip – if you want to go rock pooling and you haven’t got a net check out that area first as they are very expensive in the onsite shop. They are far less expensive in the local supermarket if you don’t have any luck at the Eurocamp reception. 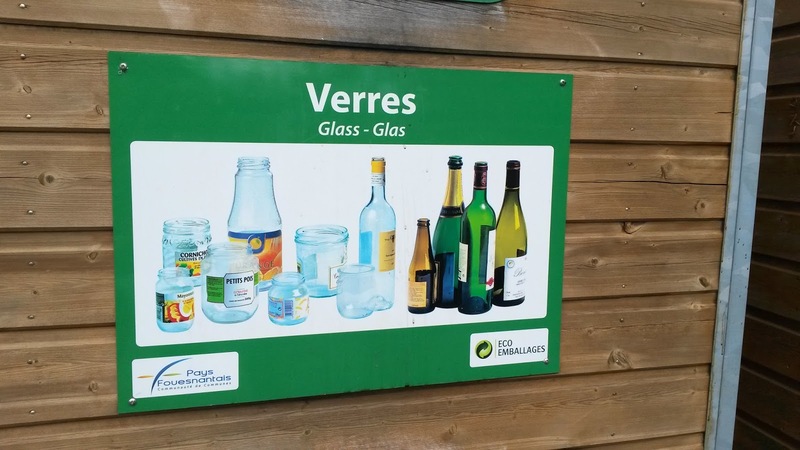 There is a recycling point in a car park just outside the campsite and lots of types of plastic, glass, paper, metal and card can be recycled there. The mobile homes are only replaced when they reach the end of their life and at that point they are sold off and so do not go to waste. The site is very leafy and green and I noticed lots of butterflies fluttering around during our stay, which was lovely. The mobile homes are self catering which leaves you in charge of the packaging you bring into them! Happily it is pretty easy to avoid packaging in Benodet. Unfortunately we failed at the first hurdle and somewhat unintentionally ended up buying practically two weeks worth of food from the supermarket on the day we got there, which was a shame as if we had been more restrained we could have bought more local and less packaged stuff, especially as we found the supermarket quite pricy. If you are going there, don’t do what we did! 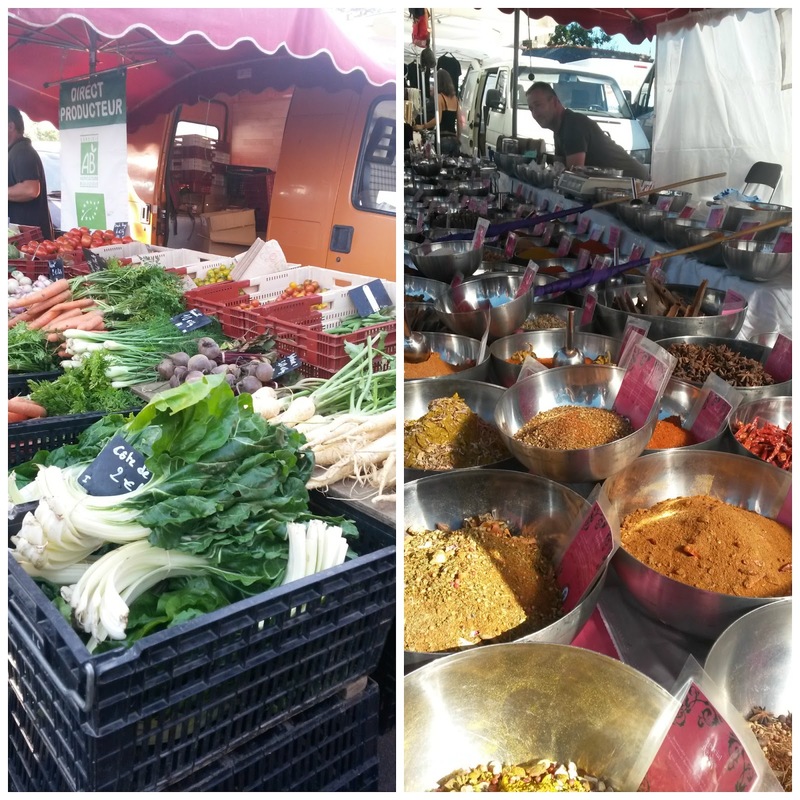 There is a weekly market in Benodet on a Monday and there was plenty of fresh and some local unpackaged produce there including herbs, spices, olives, bread, fruit and veg. There were also some local shops and even in the supermarkets there was a lot of unpackaged food so if we had taken the right containers with us (which we didn’t manage – doh) we could have done a lot of our shopping unpackaged. The shop at the campsite had fresh bread and pain au chocolate daily which you could buy unpackaged or in a paper bag for reasonable prices and they had some naked fruit and veg but they were a bit more expensive. They could provide somewhere to put food waste. I got some conflicting information while I was on site about whether there was anywhere to take food waste or not, but I couldn’t find anywhere and the Eurocamp couriers didn’t know of (or use) any food waste bins. 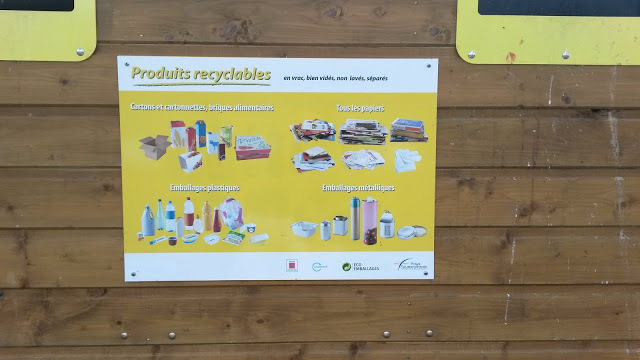 They could make it really clear to newcomers from day one where the rubbish and recycling points are, as we didn’t realise there were recycling facilities straight away. They could not wrap the linen and towels packs (something you pay extra for) in plastic wrap – I don’t think it added anything other than a bit of rubbish to chuck in the bin! I didn’t investigate every area of the business so there may well have been more good things that they were doing and/ or things that could be improved. Overall though, it was great to be staying somewhere that had taken steps to limit it’s impact on the environment and we really enjoyed our visit. This entry was tagged eco, Eurocamp, family budget, Frugal, Green, green review, kids, product review, summer holiday, thrifty, travel, zero waste. Bookmark the permalink. 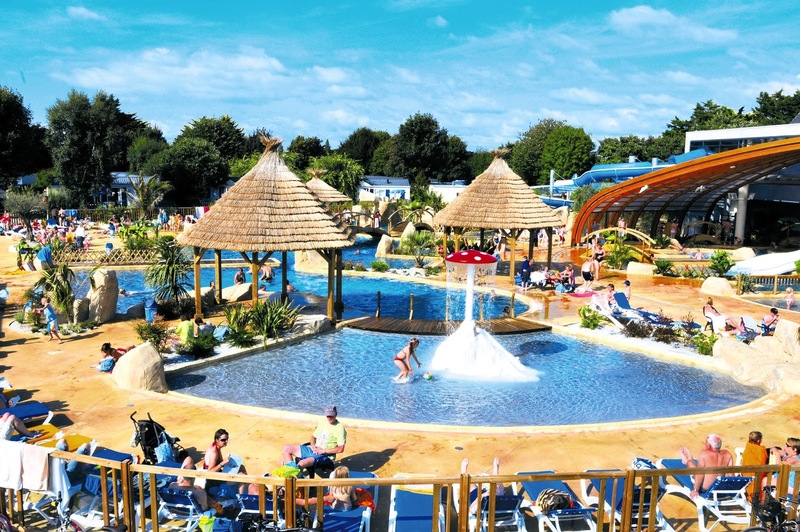 ← Beautiful Benodet in Brittany!